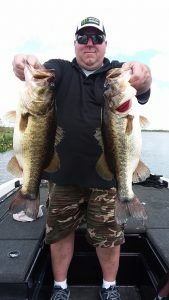 Peter Bus and his long time friend came all the way from Buffalo, New York to catch a BUNCH of nice Okeechobee Large Mouth. These guys were a blast to be with. They spent the day talking about old times and cracking jokes with each other. 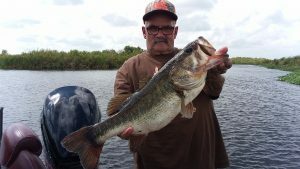 Peter runs a trucking company but is now enjoying some time away with his family in Ft. Lauderdale and made his way over to the Lake to catch this 8 lb 1 oz. fish of a life time and this 6 lb 11 oz. as well. This upcoming spawn should be VERY good so book your trip today to catch YOUR fish of a lifetime.